THURSDAY ISLAND, Australia, April 30, 2017 (ENS) – To raise awareness of the harmful impact that ghost nets can have on the marine environment, the Australian Fisheries Management Authority, AFMA, is working with Torres Strait artists to transform this waste product. Artists use the tangled nets to create works of art and use these artworks to educate the public about marine pollution. Ghost nets are lost or abandoned fishing nets that can entangle marine life, claiming the lives of fish, sea turtles and dolphins for up to eight years after they enter the ocean. The AFMA has commissioned ghost net artwork from Erub Arts for display in the AFMA’s office on Thursday Island, which lies in the Torres Strait. The Torres Strait stretches between Australia and the Melanesian island of New Guinea, 150 km (93 miles) wide at its narrowest extent. This body of water flows between Papua New Guinea to the north and the tip of Cape York, Australia in the south linking the Coral Sea with the Arafura Sea. Of more than 200 islands, there are 22 inhabited islands, with Thursday Island serving as the administrative hub. It is home to one of Australia’s two indigenous peoples, the Torres Strait Islanders. 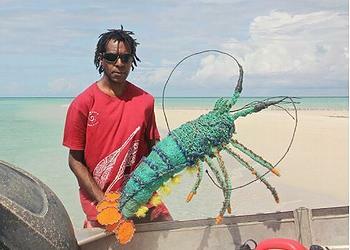 With the significance of the crayfish, also known as kaiar, to the indigenous communities in the Torres Strait and the economic importance of the tropical rock lobster fishery for the region a crayfish was the perfect choice of subject for the ghost net art project. Torres Strait artist Solomon Charlie has just completed his artwork entitled “Crayfish” after beginning in October 2016, creating the piece out of ghost nets. AFMA chief executive Dr. James Findlay said creating artwork from ghost nets that will take pride of place in AFMA offices offers an opportunity to start a conversation about marine pollution. “Ghost nets are largely found in Australia’s northern waters after they have drifted in from foreign fishers operating further to the north,” Dr. Findlay said. “Their impact on marine life can be devastating and AFMA works closely with other government agencies and the community, to detect and retrieve them,” he said. Charlie said that as an artist he is excited about the opportunity to create a tropical rock lobster out of abandoned nets to raise awareness about the damage abandoned fishing gear can cause. “Fishing is the lifeblood of Torres Strait communities and to see marine life killed by discarded fishing gear is infuriating and upsetting,” Charlie said. “I hope this crayfish and other artwork made from retrieved nets can raise awareness around this issue of ghost nets and encourage people to act when they see one,” he said. The “Crayfish” is one of four AFMA commissioned pieces to take ghost nets and create artistic representations of the marine life they threaten. 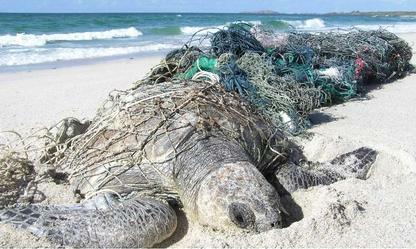 To report a ghost net in Australian waters, contact Australian Border Force’s Border Watch on 1800 009 623. Ghost nets, also called derelict fishing gear or fishing litter, are a global problem says the Global Ghost Gear Initiative, a UK-based nonprofit multi-stakeholder alliance founded by World Animal Protection. Nets, line, rope, traps, pots, floats and packing bands – an estimated 640,000 metric tonnes of fishing gear – around 10 percent of all global marine litter – is added to the oceans every year. Ghost nets are found from Norway and Scotland to the Hawaiian Islands to Brazil, from Italy to Pakistan, India and Indonesia. In February, the UN Food and Agricultural Organization, the Global Ghost Gear Initiative, the Australian government science agency CSIRO, Natural Resource Consultants and Ghost Nets Australia, and World Animal Protection took part in a workshop in Jakarta, Indonesia to develop a solution for Indonesia. The project follows agreement among these parties that adequately and systematically marked fishing gears, together with other fisheries management measures, can help reduce the abandonment and discard of fishing gear in the ocean. Gear marking can cut the unintended catch of endangered, threatened and protected species of fish and other animals and the level of illegal, unreported and unregulated, IUU, fishing, participants agreed. A pilot project in Indonesia will test the application of different methods of gear marking with fisheries management measures to reduce the prevalence of abandoned, lost or discarded fishing gears and IUU in the region. This work is starting in the summer of 2017; results will be published in the fall.